What counts most in the life you live today? The death of Gerald R. Ford was not the lead story on the newscast I happened to catch on the Sunday closest to the event. It came third, behind reports of the death of a tyrant-murderer and a rock singer. In retrospect, that seems appropriate to the "accidental president" who got very little respect while in office and who was vilified mercilessly for pardoning his predecessor. I am no historian and do not propose to evaluate the brief time President Ford served as our nation's leader. I am not a political commentator and have no thought of defending or attacking his pragmatic approach to government. But his passing has made me aware of the things people remember about one another. Yes, there were print and television pieces about Gerald Ford that chronicled his involvement in the Nixon pardon, a crisis over the U.S. merchant ship Mayaguez, and the Helsinki Accords. There were passing references to an oil shortage and the inflation crisis. But all the coverage I saw wound up focusing on his fundamental decency, his disdain for what one person referred to as the "arrogance of power," and his devotion to his wife. You won't always be where you are today. Whether you are a school teacher, bank president, or top-level executive with a major corporation, you will pass the torch to someone else before long. If you are a truck driver, factory worker, or department store clerk, you won't do it without end. Lawyer, doctor, journalist, entertainer, athlete — nobody fills any role forever. When you move, retire, or die from whatever you are doing today, people will remember you more for who you were than for what you did. Ford projected a sense of sincerity and decency. "Truth is the glue that holds government together," he said just before taking office, "not only government but civilization itself." An adopted child, he said his mother and adoptive father had three rules for him and his three half-brothers: tell the truth, work hard, and come to dinner on time. Comedians mocked him as a buffoon for a fall he took coming off a plane, but Ford didn't put their names on a hit list. He even made a joke of it himself. "I am a Ford," he quipped, "not a Lincoln." 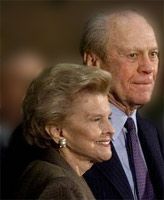 He and his wife, Betty, appear to have loved each other devotedly. They held hands and even kissed in public — unthinkable until then for an American president. They broke another White House precedent by continuing to sleep in the same bed. They spoke kindly to each other and respectfully of each other. Betty's cancer and chemical addictions were transformed by a husband and wife team into opportunities for helping thousands of others with similar problems. When all is said and done with your life and career, people are going to remember your character, the way you treated people, and your loyalty to your family more than your work. Wouldn't it be wise to think about those things now? "I am a Ford," he quipped, "not a Lincoln." A good name is more desirable than great riches; to be esteemed is better than silver and gold (Proverbs 22:1). "How People Will Remember You" by Rubel Shelly is licensed under a Creative Commons License. Heartlight encourages you to share this material with others in church bulletins, personal emails, and other non-commercial uses. Please see our Usage Guidelines for more information.